Welcome to "The Clock", the poker tournament software selected by casinos and card rooms big and small, throughout the U.S. and around the world, running everything from small daily poker events to the major poker tournaments including the World Series of Poker when it was at Binion's Horseshoe. 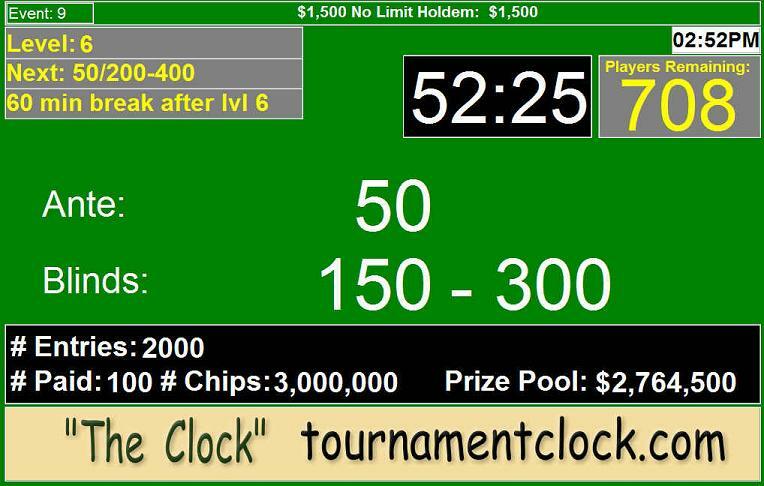 When you run your tournaments with "The Clock" everybody benefits: Your poker tournament staff no longer need worry about stop watches, checking the structure levels, remembering color ups or calculating the prizes. Your poker players no longer need to ask all the same questions like "When is the next break?" "How much time is left? ", "What are the next blinds? ", "How many players are left?" Your poker dealers always know what's happening, even after coming back from breaks, allowing you and your staff to get on with the job of running your poker tournament. "The Clock" poker tournament software is much more than just a clock face. 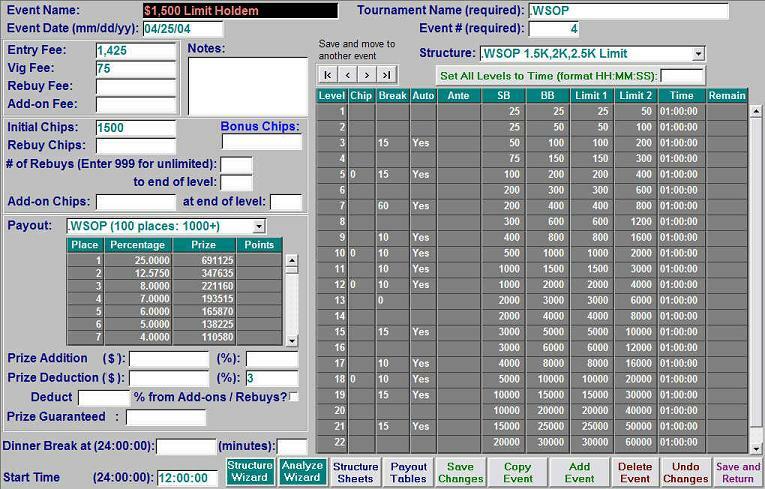 Rather than being a simple poker tournament timer, it is a complete program package that includes simple to fill in forms like the one above, and helpful features (like 'auto fill' that fills in the limits on structure sheets, especially useful for calculating pot limit raises), that make setting up your payout tables, structure sheets and poker events as easy as can be. And when it comes time to run your poker events, those same simple screens, menus and buttons are right there in case you need to make changes, like adding a break or changing the payout structure, all with the clock still running. "The Clock" can be as simple to use as literally having one click run a poker event from beginning to end unattended (and with the optional pre-programmed remote you won't even need to go near the keyboard), or discover The Clock's complete rich set of features such as automatic calculation of 'saves' and chip count deals, a timer for when you need to put a clock on a slow player or give a timeout penalty, a second clock for when you are running two poker events at once (like for an evening tournament or super satellite while the main event is still running) but only have one screen available, multiple rotating banners to advertise your property, and much more.